What parent doesn’t try to do the best for their children...taking care every day to give them what they need to keep them healthy and happy. Our first line of defense can be making sure we give daily support for our children’s immune health. Probiotics can be a great help. They provide a source of good bacteria, the wholesome kind children need to contribute to positive microflora in their body. With 70% of immune cells located in the digestive system, the challenge isn’t getting probiotics to work—it’s getting children to take them! 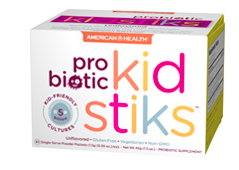 American Health’s Probiotic Kidstiks™ make it super-easy because they have no flavor, and will blend completely into foods and beverages. Your child will never taste them... and never know that they are there. Just sprinkle one complete packet of this super fine powder on cool food or mix into a cool beverage and your child is good to go! With Probiotic Kidstiks™ every packet delivers a kid-healthy serving of 5 billion, scientifically developed multi-strain cultures. All with guaranteed potency through expiration. With guaranteed potency you know the strength is maintained through the last day on the box. And, because these probiotics were especially selected for children, they are friendly for kiddie tummies too. Probiotic Kidstiks™—the perfect way to support your child’s immune system with just one easy sprinkle a day. Directions: For children ages 4 and up, empty one complete package and sprinkle on cool food or easily mix into any cool beverage, once daily. Unflavored. Other Ingredients: Fructooligosaccharides (prebiotic), Potato Starch.